It’s time for more links, along with my brief comments. Hot and Cold Cognitive Empathy – Ozy distinguishes between hot cognitive empathy, which is intuitively felt, and cold cognitive empathy, which is deliberate. Ozy observes that many autistic people develop the latter, and comments of the advantages and disadvantages. I am not autistic, and experience hot cognitive empathy, but I find it fascinating how different people have different private experiences, and develop different mental processes to fulfill the same function. Aphantasia: How it feels to be blind in your mind – Blake Ross, cofounder of Firefox, explains a revelation he had: “Picture it in your mind’s eye” is a literal expression for most people, but not for him. This is another case in point. Many people have different private experiences, but it can go under the radar for a long time because so much of our language describes only the function of our private experiences, rather than the experiences themselves. And yet, contra Wittgenstein, comparing private experiences is at least possible. This makes me wonder if I have other private experiences which are atypical. For example, I suspect that fish doesn’t taste the same way to me as it does to other people. Also, I don’t think I experience this “mystic emotion” thing that Einstein says is necessary to being alive. Einstein: what a jerk! “Gender is performative” means that gender is what you do, or it is produced by what you do. The word “performative” is taken from J. L. Austin’s concept of “performative utterances“, and refers to statements that are not truth propositions, but actions. For example, saying “I apologize” is not so much a statement of fact, but an action that creates the very apology it speaks of. Likewise, gendered behavior does not merely communicate who you are, but creates who you are. “Gender is performative” does not mean that gender is acted out, as if on a stage. It does not mean that gender is pretended. Judith Butler, the originator of gender performativity theory, says so herself in this video. Okay, but I have complaints about this video. The first thing Butler does is state the misconception, followed by “But what I mean is different.” Debunking 101: don’t do that! Generally, you should put as little emphasis on the misconception as possible, instead emphasizing the truth of the matter. People sometimes come away with a stronger memory of the misconception than of the correction. There’s a lot of literature about this, and here’s one example. Of course, the larger issue is that Butler has already invited misconceptions with the very choice of word, “performative”. It’s just too easy to confuse “performative” with “performance”. Butler herself has used the two words interchangeably on occasion. Even when people understand the difference, they often mentally compare the two concepts, even though they have virtually nothing to do with each other. This may be a contentious statement given that I am: a) not trans, and b) not living in North Carolina, Mississippi, or Alabama. But I am glad that bathroom bills have brought discrimination and harassment against trans people to national attention. The fact of the matter is that denying trans people access to public restrooms did not start with bathroom bills. It was already an ongoing problem. In the last few years, when US marriage equality was imminent, LGBT activists were worried about what would come next. For so long, marriage equality has been the LGBT issue in the US, as perceived by allies and outsiders. Activists themselves knew there were plenty of other issues like employment discrimination, trans healthcare, and de facto health and economic disparities. But if the general public starts to believe queer issues have already been solved, just like they believe for racism and sexism, then activists would run out of steam and funding. Paper: Do memes really go viral? When a meme becomes popular, we often say that it has gone “viral”. This word suggests that memes become popular by being particularly infectious. In analogy to epidemics, a particularly viral meme hits a critical threshold where it just won’t die, because each new infection spreads it to even more people. But is this epidemic model actually true? A paper titled “The Structural Virality of Online Diffusion” puts into question the very idea that popular memes are viral. They point out another mechanism by which memes can become popular: the broadcast. Rather than infecting multiple generations of followers, a meme may become popular simply by infecting one person with a lot of followers. Figure 1 from the paper. The tree on the left illustrates a broadcast, while the one on the right illustrates viral spreading. The paper considers a massive amount of Twitter data to determine whether the most popular links are broadcast-like or virus-like. On average, they more resemble broadcasts, but there is a huge amount of variation. 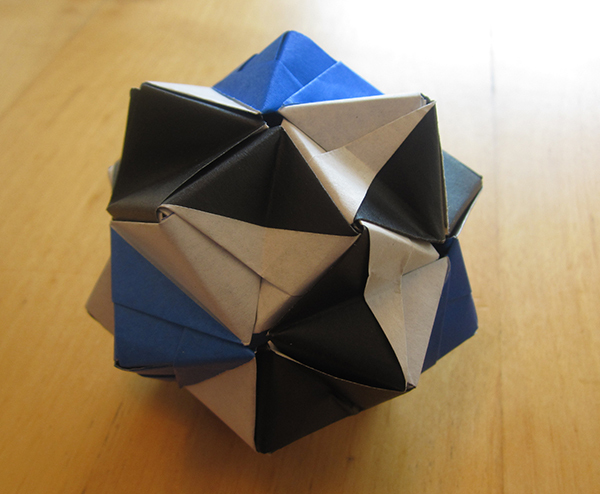 This was built using Ray Cube units, designed by Meenakshi Mukerji, contained in her book, Origami Inspirations. This model shows how you can take a standard unit, and make something more out of it. First, this is obviously not the cube it was designed to be. Second, the colors form deliberate patterns. It’s not difficult to make, but required a bit of planning. When I first saw this mechanic, my reaction was, “So adventure game designers finally discovered Nikoli-style puzzles, eh?” Nikoli is a Japanese publication that popularized a certain genre of puzzles using numbers or symbols on a grid. The best known puzzle of this genre is Sudoku, but there are many others, like Fillomino, Heyawake, Numberlink, Masyu, Slitherlink, and Nurikabe (almost all of which I think are better than Sudoku). Outside of Nikoli, you can find many more created by Grandmaster Puzzles, and you can try the annual US Puzzle Championship. I should mention that I am fairly competitive in the USPC. The advantage to Nikoli-style puzzles is that they’re scalable. 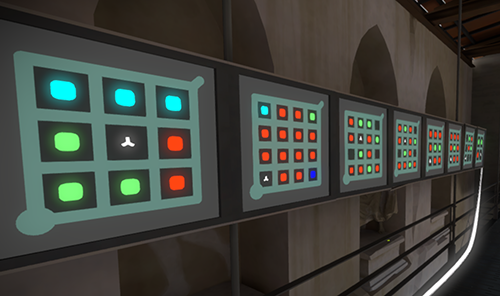 Contrast with the Myst series, where most puzzles revolve around poorly-designed user interfaces for fantastic mechanisms. Could you really pack hundreds of such puzzles in a game? It would be too hard to write all those puzzles, much less make the graphics to support them. And since there are so few of those puzzles in the game, you have to make sure each one counts for every player, without being so challenging that players start looking for solutions online. On the other hand, as far as Nikoli-style puzzles go, dedicated puzzle-crafters will have video game designers beat. Sorry, Professor Layton! What I want to see in a video game are puzzles that could only be done in a video game. Luckily, The Witness passes this test, being a lot less like a Nikoli puzzle than it first appears, and not just because solutions are non-unique.